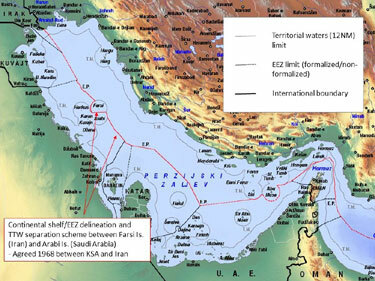 Never Yet Melted » Why Were US Boats Near Farsi Island? Why Were US Boats Near Farsi Island? J.E. Dyer suggests that those riverine command boats were exposed to capture by Iran’s revolutionary guards because they were traveling a route intended to avoid Saudi waters. The routine expectation that archipelagic transit will be accommodated by littoral states is a bedrock principle of the Law of the Sea. The Saudis may have had particular reasons over the years to be wary of extending that accommodation to some parties in the Persian Gulf. But that’s not a mitigating factor for a sea change in expectations that affects the United States, of all nations. If this is why we took an especially dangerous route to move small boats around in the Gulf, it’s a very bad portent for the international order. The Law of the Sea itself falling apart is a key development that means we’re already in a world war, whether it’s been formally declared, in Westphalian style, or not. I note, for completeness, that the CENTCOM news release isn’t convincing on the valid question of how 10 Navy sailors could possibly have exhibited the uniquely bad seamanship implied by the official explanation. It remains extremely unlikely that they failed to notice a navigation error taking them into Iranian waters. One mechanical error – earlier disavowed by DOD, now resurrected – between two boats doesn’t so absorb the attention of two boat drivers and two navigators that everyone strays off course. But it looks like it’s “interesting times” for the U.S. Fifth Fleet today. If, as seems probable, there are important things we’re not hearing about the collapse of the status quo in the Gulf, those things are bound to be affecting maritime operations there. The situation is only going to get worse. One Feedback on "Why Were US Boats Near Farsi Island?"